← Everyone Must Die, including the gays! A while ago, I posted a blog on slug movies, which you can read here. 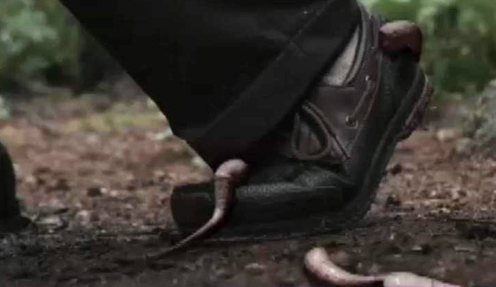 Slug movies should make you squirm, even if the slugs are well-done CGI, as is the case with Growth. The slugs look really cool. But, I wasn’t squirming. Two guys and two girls come to an island to clean up one chick’s old house to sell it. Brian Krause, our beloved Leo from Charmed, is one of them, and he is aging quite nicely. But Brian and his girl aren’t even the focus here. They’re kind of boring. It’s the other couple that gets to have all the fun. This cute young blond dude and his blonde female friend head down to the water, he strips to his boxer briefs (wahoo), takes a swim, comes back to the beach to be with his girl…and she’s not the only one who ends up getting slipped the slug. 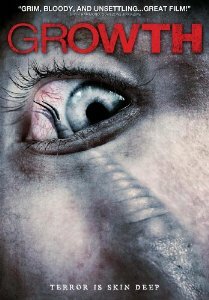 The gore and slug effects are awesome in Growth, there’s excellent suspense and some cool action, and there is one great fricking chase scene in the woods. There’s also a mysterious black hooded figure adding to the intrigue and some insane and unexpected twists and turns. Put it all together, and you have a very odd film that isn’t as smooth to swallow as the slugs in, say, Slither or Night of the Creeps. Of course, Growth is also not even slightly a comedy. This is serious business. And amazingly, because it’s so serious, there’s something not even icky about the slugs. Or maybe because it’s CGI? I don’t know. Finally, there’s a tag scene after the end credits. I really wish filmmakers would stop doing this. It’s not going to get me to sit through the credits when I have a FF button on my remote. This entry was posted in Movie Times & Television Schedules - Staying Entertained, The Evil of the Thriller - Everything Horror and tagged creature feature. Bookmark the permalink.